I went to New York City last weekend to visit some of my friends from study abroad. One friend lives there, the other was visiting from Alabama. Since I’m only four hours away from the city, I figured it’d be easy enough to go up for a night and see them. I figured correctly. I had a blast. My friend who lives in NYC studies at Hunter College, and her dorm is down 1st Ave. She was sweet enough to let me stay with her and sleep on her couch, which saved me a TON of money on accommodations (when I was first looking for a place to sleep, I considered staying at a budget hotel or hostel in the city. Hell no. Even those cost at a minimum $50/night, and those were the sketchy places. While I’m broke, I still do somewhat value my safety. Thankfully, my dear friend saved me from this nightmare). 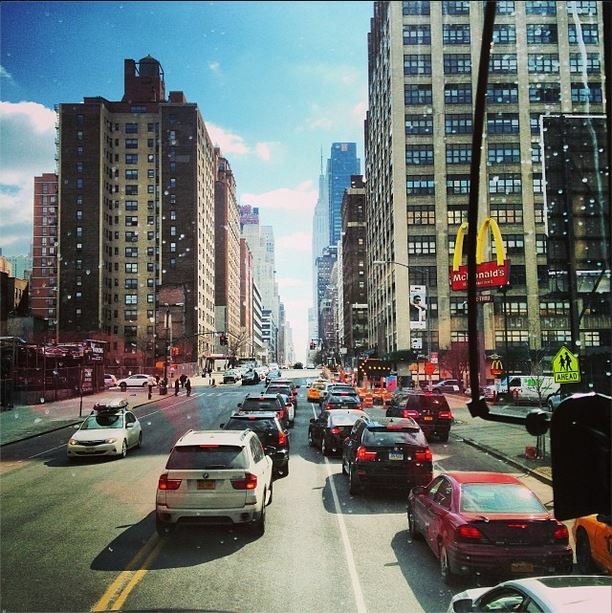 To get to New York, I took Megabus, of course. Because I waited until the day before I left to get my ticket, I had to spend a little more than I had expected: roughly $60 round trip. Generally, RT tickets from D.C. to NYC cost about $40, sometimes even cheaper. Oh, how I love the city. When my bus arrived at 3 p.m., I chose to walk to my friend’s dorm instead of call a cab. It took about 45 mins, but I loved every second of strolling along those New York streets, skyscrapers towering over my head, eclectic people hustling by, vendors selling hotdogs on every corner and uneven sidewalks making it super difficult to carry my stuff. When I got to my friend’s apartment, we spent spent hours catching up over a bottle of red moscato. It had been over eight months since we studied abroad together! Then we got ready for a night out and went to meet our Alabaman friend at West 4th. Mmm, the New York subway. When we finally saw her, of course shrieks, hugs and “I missed you”‘s were in order. After that, we walked around, took in the city air and took lots of pictures. For dinner, we went to The Park, an awesome American restaurant with great food. We had some drinks, caught up even more, then went to the lounge area of the restaurant to get cray and dance. The Park has an incredible, earthy interior, and the dance floors were perfectly situation between the bars. I’ve also got to note The Park’s fantastic music selection, which was ridiculously on point all night. We stayed and danced for a few hours, being sure to watch the dance off that broke out on the second floor; then headed to Finnegans Wake, an Irish pub down the street from my friend’s dorm, to wind down over some cheap IPAs. We stayed til 3 a.m. and finally parted ways as our Alabaman friend went back to her hotel and my NYC friend and I headed back to her place. I wish I could have stayed longer, but I had to leave early the next morning to get home to study for exams. 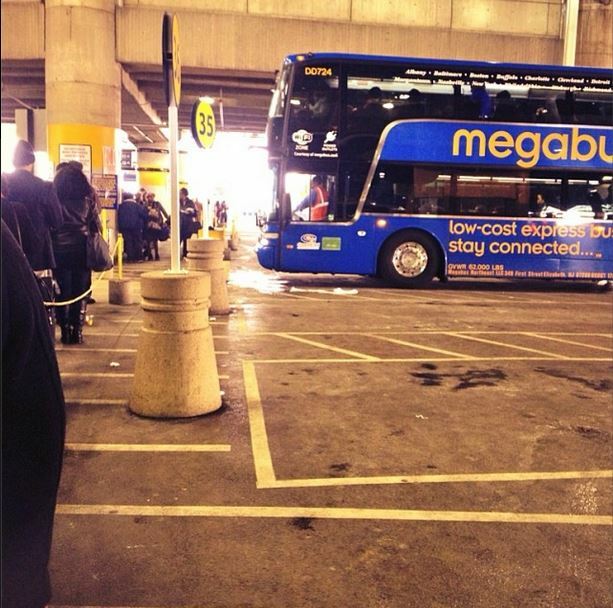 My sweet friend saw me off in the morning, and then I traveled to the bus port to catch my bus back to D.C.
As much as I love Megabus, I’m going to throw the company a little under the bus here (pun intended) and say that I was a bit disappointed with the service. My bus from D.C. to NYC was a late getting to the terminal, and the bus wasn’t even a Megabus bus — rather a generic Dillon’s Bus Service one. I was comfortable nonetheless, but the bus didn’t have wi-fi or power outlets — two things a blogger can’t live without. Also, the bus I took back to D.C. got to the New York terminal late as well. I’m not usually one to complain, but it was not pleasant having to stand out in that New England cold for an extra 30 mins, nor to get home 30 minutes later than anticipated. The Big Apple was majestic as always, but I always take note of the bad smells, polluted air, rude people, crowed streets, trashed sidewalks, traffic jams, street urchins and dirty subways. I know these are all things that make New York such an iconic city, but I can’t help but compare to the beautiful streets and wonderful people of the cities I visited in Spain. But that’s America for ya. Previous Post My Best Friend and I are going to Switzerland!